Maurice Hendry Argues That Far From Flying Before The Wright Brothers, Richard Pearse Never Achieved Anything Of Lasting Value. He Writes That The Claim That Pearse Achieved Flight Is A Myth And That The On-Going Attempts To Elevate Pearse To The Level Of The Wrights' Are Nothing Short Of Ridiculous. Qantas Has Led The Current Profusion Of European Aircraft Buying Downunder, Singing For 25 Airbus Types Over The Next Few Years. The First Of These Aircraft - A330S - Have Begun To Arrive And Recently Peter Clark Headed To Sydney To Fing Out More. 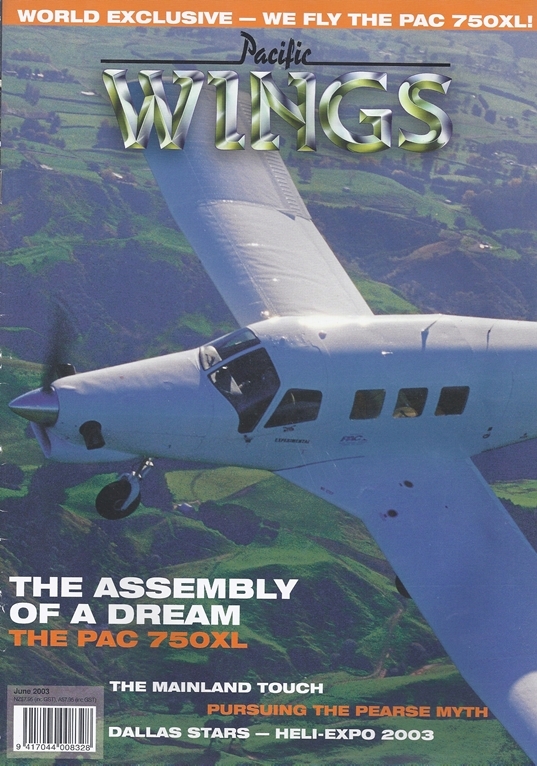 Late In May, Peter Clark Became The First Journalist In The World To Fly Pacific Aerospace Corn'S New Pac 750Xl, A New Zealand Designed And - Built Aircraft Only Days Away From Certification. He Also Spoke With The People Behind The Project; The Pilots, The Managers, And The Engineers. Who, What And Where Are Mainland Air Services, And What The Heck Do They Do? Rob Neil Recently Headed To Dunedin (A Small Village Situated South Of The Auckland Control Zone) To Find Out. Wings Uk Correspondent Peter Cooper Looks Back On This Interminable Type. Peter J Cooper Dons A Cowboy Hat, Boots And A Thirty-Six Shooter And Reports From Downtown Dallas, Texas, On Heli-Expo 2003. This Month Gerard Morris Considers The ""Small"" Tourist Operator.